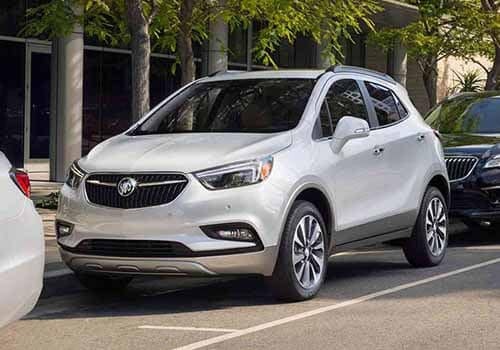 The 2017 Buick Encore safety features are not the first thing you notice about this compact luxury SUV, but they are one of its most important components. Thanks to sophisticated sensors and advanced technologies, this model actually helps you avoid accidents and hazards on the roads of Orange Park. And if you are involved in a collision, careful engineering allows the Encore to withstand more than the competition. When you’re ready to explore the interior and venture out on a test drive, head to Nimnicht Buick GMC in Jacksonville, home an extensive new Encore inventory. If a vehicle is present in your blind zone, a subtle notification is displayed on the side view mirror. That way you have complete confidence when you're changing lanes safely. Sensors monitor the position of the Encore in relation to the vehicle in front of it. If you are in danger of hitting the rear of a vehicle, an alert sounds enabling you to take action sooner. It is easy for a vehicle to drift out of its own lane of traffic and into another. This feature monitors when the vehicle is starting to drift out of its lane and sounds a warning to keep the driver aware. Guiding the Encore into tight spaces is easy thanks to a feature that sounds a series of alerts as you approach objects out of your view. Along with the rearview camera, this makes navigating a larger vehicle as easy as possible. All your travel St. Augustine travels will be safer thank to additional features like rear cross traffic alert. If you are backing up and another vehicle is approaching from outside your line of sight, an alarm sounds to keep you from being hit. The OnStar telematics system also extends the security of the vehicle thanks to emergency crash notification and connections with roadside assistance providers. If and when you need help on the road, it’s faster and easier than ever to access it. The latest Encore is impressing both drivers and critics, and it’s even beating some popular models like the Honda CR-V. Find out what makes this model such a compelling option by visiting Nimnicht Buick GMC in Jacksonville. Feel free to complete a financing application at any time, and contact out team if you need more information before you stop by.